We had some very strong entries in response to our call for entries for a group show on the subject of Roots. We decided to choose ten winners rather than five, and here they are! All of the entries, even those not chosen here, were very strong and intriguing, and it was difficult to narrow it down even to ten. You can see the group show Here. 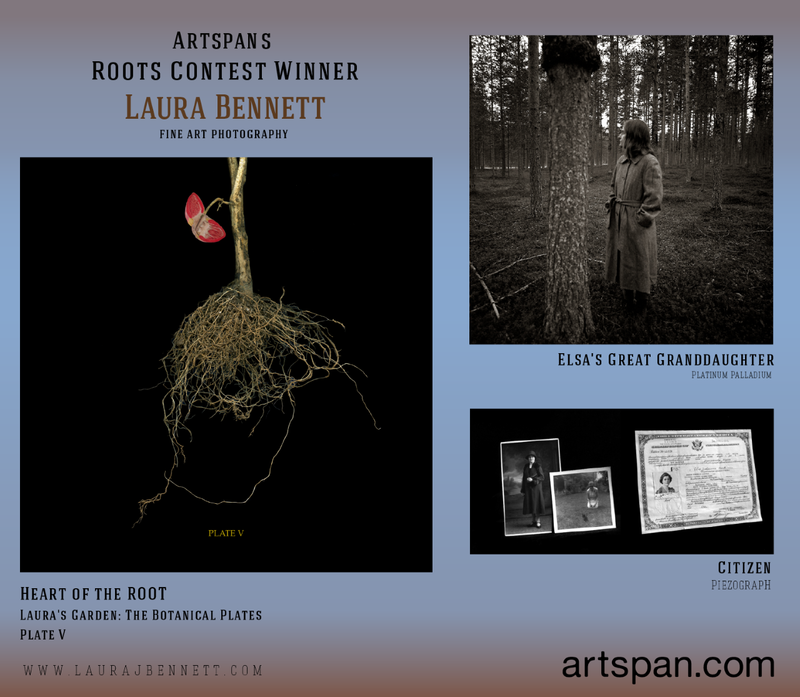 See more of Laura J Bennett's haunting and gorgeous photographs at laurajbennett.com. 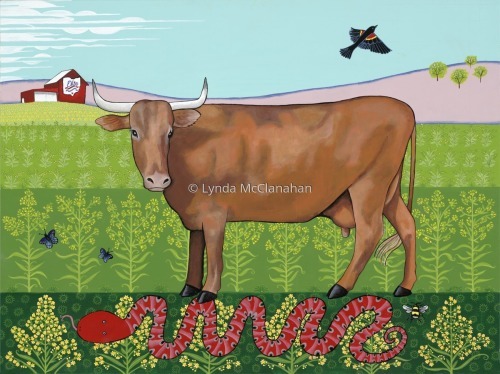 McClanahan's bright, engaging portrait of an American Devon milk cow in field of goldenrod with Bicentennial Ohio barn gives a folk-art accent to a celebration of American Heritage. American Devon is an heirloom breed of cattle raised by early American homesteaders. The snake crawling in the roots under the cow's feet asks mischievous questions of the viewer. Sam Elkind's photo essay "Legacy of Hard Use" examines the impact of humanity on the Southwestern landscape. To quote Aldo Leopold's treatise The Land Ethic, "The impact of occupancy here brought no bluegrass, or other plant fitted to withstand the bumps and buffetings of hard use. This region, when grazed by livestock, reverted through a series of more and more worthless grasses, shrubs, and weeds to a condition of unstable equilibrium. Each recession of plant types bred erosion; each increment to erosion bred a further recession of plants...It is quite invisible to the tourist who finds this wrecked landscape colorful and charming (as indeed it is, but it bears scant resemblance to what it was in 1848)." Elkind's images of roots clinging to the ravaged landscape strike a note of strength and continuity, and a sense that nature will prevail. 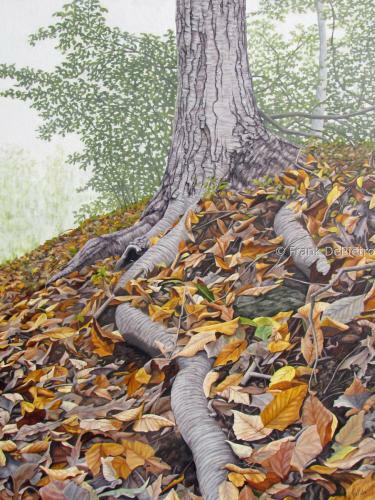 Frank De Pietro's evocative painting of sprawling roots coated with autumn leaves seems to provide a roots-eye view of the tree itself. The unusual perspective highlights the mysterious strength of the roots of a tree, and suggests at the secrets living within their twisting limbs. 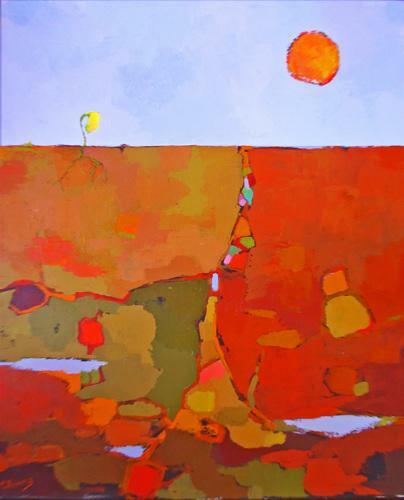 Phyllis Dobbyn Adams dynamic painting Synergy explores the connection between earth and sky; sun, soil and seedlings. The delicate roots of the seedling reach to a mysterious world below, teeming with life and promise. Graphite on Arches 88 paper. 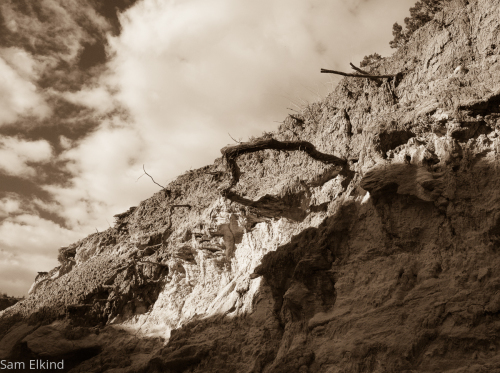 "I found these exposed, tangled tree roots near a hot spring in the Sierras. The pine tree seems to hold the cedar from slipping downhill, a supportive relationship that has developed over perhaps hundreds of years." 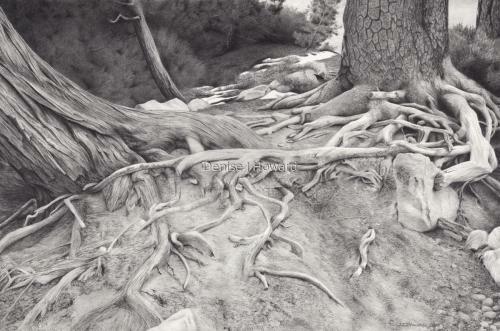 Rose's digital drawing reveals the mysterious depths of the roots beneath our feet. 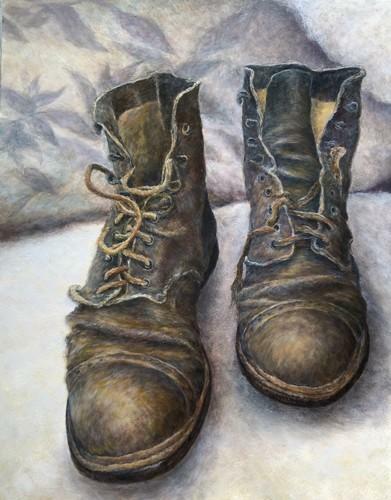 "'Kep's Boots' depicts my great-grandfathers hiking boots. He is Horace Kephart, author, and one who facilitated the Great Smoky Mountains becoming a National Park. The 3rd highest peak in the Smokies is Mt. Kephart in his honor." This touching painting radiates with family roots and tells the story of a man strongly rooted to the land with respect and affection. 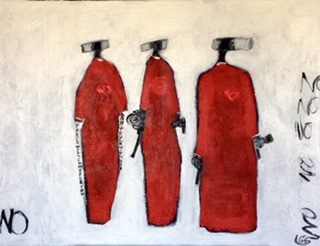 "The word 'roots' means not only origins but something grounded, the origin and/or birth of a person, place or thing, I meant this painting to be a political statement that we, women of America, will NOT sit idly by and watch our civil rights be taken away by evangelical extremists. Nor will we (I) ignore the turning back the clock on our reproductive (roots, origins, birth) rights and control over our own bodies by a hard line, misogynist Regime. If you pull out a plant by its roots and do not replant it, it will die. If you ignore the roots of a people, in this case, women of all creeds, colors and origins, the rights of all people to freedom over their history and of course, their bodies, will die. Roe Vs Wade will NOT be uprooted, the ERA will NOT be uprooted, We will NOT be budged." "We all know home gardners that adore their gardens. They bring us beauty and great food! My mother pulled these onions from her garden and promptly suggested they were so beautiful they needed to be painted. I had to agree with her." These are the roots that nourish, that add the flavor and sustenance that helps us to survive."